You’ll create a kaleidoscopic art piece on fabric, as your learn to incorporate binding, knotting, twisting and pleating in cotton fabric to achieve three-dimensional effects of color using indigo. While your creative creations are in the vat, you’ll learn how to make Japanese furoshiki and later transform one of your dyed pieces into something beautiful. You will learn how to: dye fibers using all natural materials, how to extract colors from plants, kitchen waste and herbs, what mordants are and how to use them and all about fixatives. 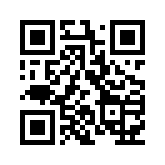 Or scan this QR code with your smart phone. Whether you are an experimental craftsperson, a beginning dyer or a gardener interested in new uses for traditional plants these workshops can be of interest to you. Discover how to dye and print with foraged flowers and leaves from your local neighborhood. We will be transferring the beautiful colours from flowers, plants and natural pigments onto a blank silk canvas and turn it into a wearable work of art. In these workshops participants learn basic couture techniques while constructing a garment from true vintage sewing patterns! The first step to designing clothes for yourself and others is making your own sewing patterns. At Center Studio 518 there are classes and workshops that introduce participants to all three areas of pattern making: draping, flat pattern making and drafting. The Bitter Experience: More information coming shortly.